The index traversed yet another volatile week but still managed to notch up strong gains. The Federal Reserve hinted that it was unlikely to announce any rate hike this year, following signs of economic weakness. But investors remained concerned over the lack of clarity on the status of trade talks. Sharp movements from shares of Apple (AAPL - Free Report)	and Boeing (BA - Free Report)	largely determined the direction of the index. The index gained 0.5% last Friday as optimism around a U.S.-China trade deal boosted investor sentiment. Further, China’s pledge to counter its economic woes also boosted indices. Gains for the 30-stock index were buoyed by a 1.5% surge in the shares of Boeing after reports surfaced that the aerospace giant was planning to initiate a software upgrade for its 737 Max model. The index increased 1.6% over last week. This was the Dow’s best weekly gain since Feb 15. Meanwhile, the UK parliament voted against a no-deal Brexit and President Donald Trump said that he was ready to give more time for a trade deal with China. In other news, Fed chair Jerome Powell remained bullish about the U.S. economy. 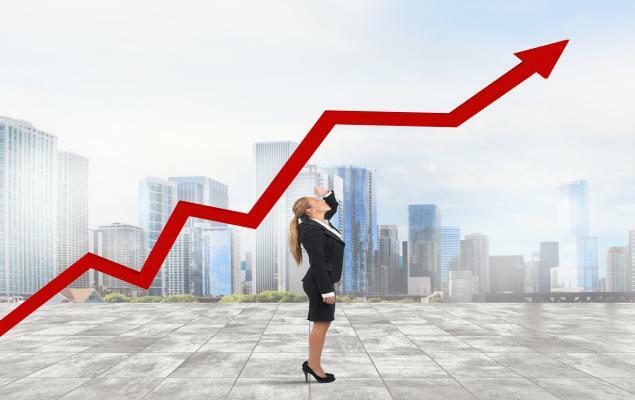 On Mar 10, in an interview with “60 Minutes”, Fed chairman Jerome Powell said that the U.S. economy will continue to grow in 2019 albeit at a slower pace. However, investors remained anxious about the delay in sealing a U.S.-China trade deal. Moreover, weak earnings data from the United States and China also dented investors’ confidence. The index increased 0.5% on Monday ahead of the Federal Reserve’s two-day policy meeting. The Dow registered its fourth consecutive close in the green. Meanwhile, federal prosecutors began scrutinizing the development of Boeing’s MAX 737 jetliner. The Dow also posted its best close since Mar 1. Gains for the 30-stock index were buoyed by a 1% rise in the shares of Apple. However, gains for the index were capped by steep losses for Boeing. The index lost 0.1% on Tuesday after reports surfaced that trade talks between the United States and China had hit a rough patch. Following this, the three major benchmarks pared early gains. Shares of Apple declined 0.9% and were the biggest drag on the 30-stock index. The index lost 0.6% on Wednesday following a decline in bank stocks after the Fed indicated that further rate hikes in 2019 were largely unlikely. Following the central bank’s statement, yields on various government bonds took a nosedive. Moreover, conflicting news from the trade war front also dampened investors’ spirits. The index gained 0.8% on Thursday, enjoying its best daily gain since Feb 15. Stocks were propelled higher after the Fed hinted earlier this week that it was unlikely to raise rates this year. Gains for the index were powered by shares of Apple which gained 3.7% after being upgraded by Needham. Apple updated its iPad and iMac devices, prior to the much-anticipated Mar 25 event, where the iPhone-maker is set to launch video streaming and news subscription services. Zacks Rank #3 (Hold) Apple also launched the new 7.9-inch iPad mini that delivers “three times the performance and nine times faster graphics.” The device is 25% brighter and has the highest pixel density among any of the iPads, powered by the advanced Retina display with True Tone technology. Exxon Mobil Corporation (XOM - Free Report)	and TOTAL SA (TOT - Free Report)	have reached an agreement related to increased gas exports from Papua New Guinea (PNG). Per the plan, the capacity of Zacks Rank #3 ExxonMobil-operated PNG liquefied natural gas (LNG) plant will be increased to around 16 million tons per annum (mtpa) from its current capacity of 6.9 mtpa. According to analysts, the move will enable the company to compete with Australia’s biggest LNG projects. The cost of the expansion is valued at about $13 billion, lower than the initial cost projection of $19.5 billion. The cost per ton is less than 50% from Chevron Corp’s (CVX - Free Report)	Gorgon LNG plant in Australia. Boeing recently won a $327 million contract to upgrade the P-8A aircraft. The contract was awarded by the Naval Air Systems Command, Patuxent River, Maryland. Per the terms of the deal, the aerospace giant will develop, integrate and test Increment 3 Block capabilities into the P-8A aircraft for the Navy and the government of Australia. Majority of the work related to the deal will be performed in Puget Sound, WA. The entire task related to the deal is expected to be completed by March 2024. Boeing will utilize fiscal 2019 research, development, test and evaluation (Navy) funds and Cooperative Engagement Agreement funds for completing the task. The stock has a Zacks Rank #1 (Strong Buy). You can see the complete list of today’s Zacks #1 Rank stocks here. Goldman Sachs (GS - Free Report)	, through its subsidiary Goldman Sachs Asset Management ("GSAM"), has agreed to acquire Standard & Poor's Investment Advisory Services LLC ("SPIAS"), a wholly owned subsidiary of S&P Global (SPGI - Free Report)	. The deal is expected to close in the first half of 2019. 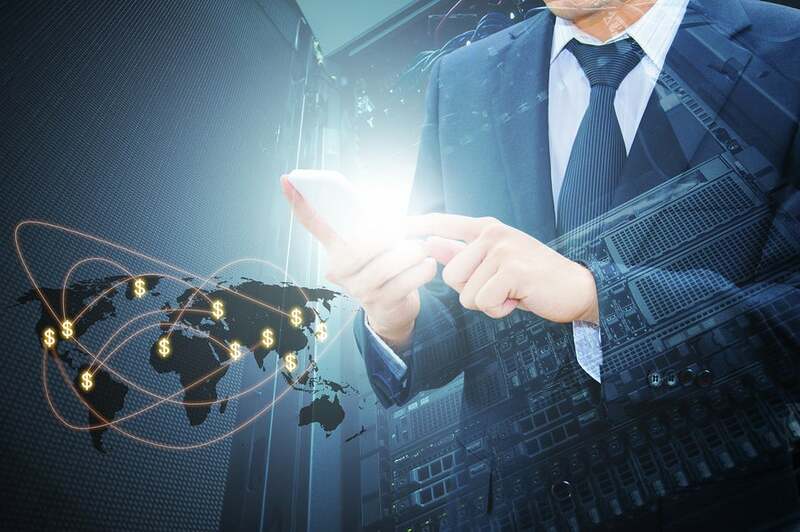 SPIAS manages portfolios using Exchange Traded Funds (“ETFs”) and mutual funds, as well as equity portfolios produced employing a rules-based investment process. It is a provider of non-discretionary advisory services to institutional clients on a global level. As of Dec 31, 2018, it advised on more than $33 billion in assets across multi-asset, equity, and fixed income strategies. Pfizer, Inc. (PFE - Free Report)	and partner Merck KGaA announced the discontinuation of a late-stage study evaluating a combination of its PD-L1 inhibitor, Bavencio and its new PARP inhibitor, Talzenna (talazoparib) for first-line ovarian cancer. Pfizer has a Zacks Rank #4. The phase III JAVELIN Ovarian PARP 100 study (n=998) evaluated Bavencio (avelumab) + chemotherapy followed by a maintenance treatment of avelumab + Talzenna versus an active comparator for previously untreated advanced ovarian cancer. The companies said several factors led to the decision to end the JAVELIN Ovarian PARP 100 study, which did not include safety reasons. First, the degree of benefit observed with avelumab in frontline ovarian cancer in the JAVELIN Ovarian 100 study did not support continuation of the JAVELIN Ovarian PARP 100 study, the companies said or for that matter evaluating an immunotherapy in ovarian cancer itself. JPMorgan Chase (JPM - Free Report)	has started offering low-fee checkless accounts. The new account, called Secure, does not require any minimum balance and has access to the company’s mobile app, branches and ATMs for $4.95 a month. The news was first reported by Reuters. JPMorgan has a Zacks Rank #4. 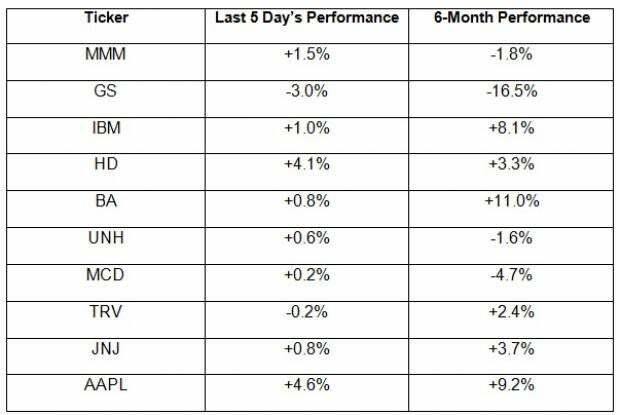 The table given below shows the price movements of the 10 largest components of the Dow, which is a price-weighted index, over the last five days and during the last six months. Over the last five trading days, the Dow has gained 0.6%. Boeing’s woes are far from over and will continue to trouble the Dow for some time to come. However, the stock’s fundamentals are in place and such volatility could be short term at best. Further, investors will be relieved that a rate hike has been more or less been ruled out for the year. However, concerns over trade negotiations continue to linger and will likely keep investors guessing next week. If crucial economic data, such as upcoming GDP numbers are encouraging, stocks could receive the impetus required for steady gains in the days ahead.